While networks have a way of surprising everyone with their random cancelations, the signs are often there on the horizon (or closer) to signify when a project’s demise is near. And though we’re certain that more than ten series are going to be put to rest over the next few months, here are the ten current shows most likely to get the axe. Fresh Off the Boat and Odd Couple, you’d better work extra hard to avoid making a list like this later on. 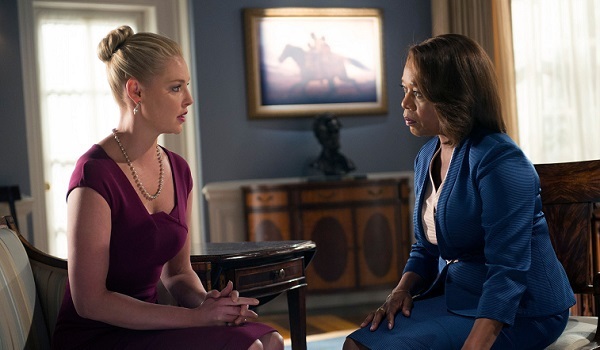 Katherine Heigl’s return to TV following her clamorous exit from Grey’s Anatomy, State of Affairs centers on Heigl’s CIA analyst Charlie Tucker as she assists in constant high-risk situations involving everything from 4Chan to potential terror attacks to foreign prison escapes. Because if you’re not analyzing, you better damn well be figuring out how to rescue 20 kidnapped soccer players. Why Would it Go? : State of Affairs seems to have a more dependable DVR viewer base than a live one, as the show’s ratings have mostly ebbed since the first handful of episodes. And the overly serious tone has kept the critical acclaim quiet enough to justify assumptions that NBC will opt out on heaping any money into a Season 2. A fairy tale comedy musical from Crazy, Stupid, Love director Dan Fogelman, legendary composer Alan Menken and lyricist Glenn Slater, ABC’s Galavant tells the tale of a spurned knight (Joshua Sasse) who aims to win back the love of his life (Karen David) from the fabulously evil King Richard (Timothy Omundson). At eight episodes, Galavant’s limited series approach doesn’t fool me into thinking ABC didn’t want this thing to become a giant franchise-able hit. Why Would it Go? : While many people (like myself) love the refreshing take on TV musicals, the double-episode airings haven’t been great for Galavant’s ratings, which have dipped each week. Something tells me Sunday’s broadcast of the final two episodes won’t be the graceful rescue the show needs. This Syfy series stars Emily Rose as FBI Special Agent Audrey Parker, who investigates and tries to squash the supernatural troubles – called Troubles, helpfully enough – that are plaguing the town of Haven, Maine. The show is currently in the middle of its split-in-half Season 5, the first half of which aired last fall. Why Would it Go? : A split season is rarely good for a series, and tends to only happen when a show is on its way out. As well, Syfy’s reinvigorated push towards a schedule with a majority of actual science fiction doesn’t leave much room for this paranormal stayover. 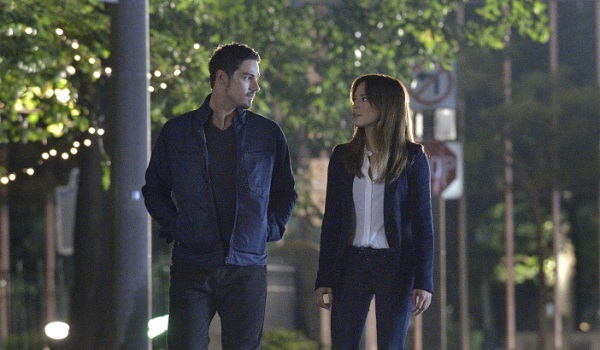 Developed by Sherri Cooper and Jennifer Levin, Beauty and the Beast added more romantic fantasy to The CW’s lineup, as Kristin Kreuk’s Cat Chandler meets, bonds with and eventually falls in love with Jay Ryan’s Vincent Keller, whose time as part of a secret military program gave him DNA that allows him to turn into a beast. As you can imagine, nobody wants him roaming the streets. Why Would it Go? : According to the ratings for the show’s first two seasons, not a lot of people want him roaming across their TV sets, either. Beauty and the Beast was supposed to debut its Season 3 as part of the 2014 fall season, but it’s January and there is still no release date, which doesn’t bode well for it pushing into Season 4. A surprise summer hit for CBS, Extant told the near-future story of astronaut Molly Woods and her strange time in space, combined with mothering an android son and working for a government organization that runs on conspiracies. Why Would it Go? : Taking into account Halle Berry’s movie schedule, Extant didn’t seem like the kind of show that was going to get a second season. And now that it has, it’s changing almost everything about its plot, leaving a chunk of the main cast behind to follow a different narrative trail. Hard to renew a show without a clear endgame, and I see this one nipping a third season in the bud before the second one starts. Speaking of endgames, Constantine isn’t the kind of show that would need to worry about that, considering how ripe its comic book history is for the story-plucking. Starring Matt Ryan as the titular occultist, Constantine is a darkly comedic demon-of-the-week series that speaks clearly to its fanbase. Why Would it Go? 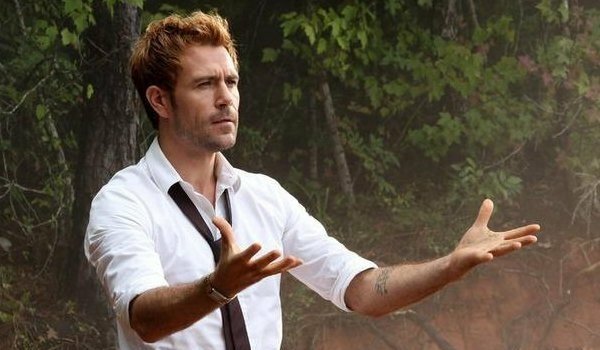 : Despite the voices of many wanting more, NBC has kept mum about Constantine’s fate after they ended production following the initial 13 episodes. Its ratings are neither terrible nor amazing for its Friday night slot, but it could use more of a lead-in audience from the higher-rated Grimm, as well as a few Internet campaigns to get it back. An example of a winning book-to-movie-to-TV adaptation, About a Boy is Jason Katim’s take on Nick Hornby’s novel about a man-child who can’t help but be the only thing he knows how to be, this time with David Walton starring as Will Freeman. Will strikes up a friendship with the 11-year old son (Benjamin Stockham) of his neighbor (Minnie Driver), and emotional growth through comedic bonding ensues. Why Would it Go? : About a Boy getting a second season was something of a surprise anyway, and the declining ratings and recent episode cut hasn't helped the cause of keeping it on. To make matters worse, NBC is pulling it off the schedule in March. 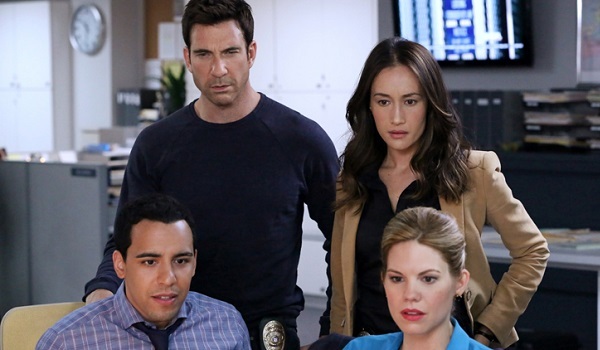 Created by former teen horror flick scribe Kevin Williamson, CBS’ Stalker stars Dylan McDermott and Maggie Q respectively as Detective Jack Larsen and Lieutenant Beth Davis, members of the New York City Threat Assessment Unit. With stories that sometimes feel like they were written fueled by an 11-year-old’s soda-induced sugar rush, Jack and Beth stop – get this – stalkers, as well as other obsession-fueled perps. Why Would it Go? : Despite having solid ratings that hover between seven and eight million people a week – ratings good enough to get a full-season order after the first few episodes – Stalker is one of the more critically assaulted series on network TV right now, and for good reason. I’m guessing any steady decline in viewers will cause CBS to balk at ordering a second season. Based on a Spanish series, NBC’s The Mysteries of Laura sees Debra Messing as a New York homicide detective whose job of hunting murderers is nearly as problem-filled as her home life, in which she’s raising two kids while going through a divorce from her husband/boss. Why Would it Go? : For one, it’s not a great show, and a lot of people know it. Second, despite earning itself a full-season order a month into its run, The Mysteries of Laura returned from its winter hiatus to its worst ratings yet. But it’s hard to root for the destruction of anything Messing is a part of. The admitted outlier upset in this bunch, Marvel’s Agent Carter brings to ABC a period drama like few others out there, starring Haley Atwell as the S.S.R. officer Peggy Carter, who is secretly working with in-hiding genius Howard Stark. It’s comic book post-war espionage with the expected ties to the Marvel Cinematic Universe. Why Would it Go? : The good-but-not-great ratings aren't reassuring. If this show can’t draw mass audiences in one eight-episode limited series, what luck would ABC have in making a full season worth of episodes? Super Nielsen to the rescue. Which One Of These Shows Would You Miss The Most?